WASHINGTON, D.C. – Cam Newton has been named Week 11 NFLPA Community MVP after serving a Thanksgiving meal to more than 1,200 underprivileged kids and some of their family members at his seventh annual “Cam’s Thanksgiving Jam.” He also provided a full second Thanksgiving meal for the attendees to prepare at home. The Nov. 19 event took place at Topgolf Charlotte, where Newton was joined by family members and volunteers in hosting the largest group ever served at one of the Cam Newton Foundation’s hallmark programs. Along with the meal, participants were able to enjoy face painting, a live DJ, games, arts, crafts and unlimited golf. The kids in attendance were pulled from groups within the Second Harvest Food Bank of Metrolina’s Kids Café Program, which connects the food bank with non-profit agencies that serve at-risk children. The Carolina Panthers quarterback works to do his part through The Cam Newton Foundation, which is committed to enhancing the lives of young people by addressing their socioeconomic, educational, physical and emotional needs. Under the theme “Every 1 Matters,” each of the foundation’s programs falls under one of three campaigns: Every 1 Learns, Every 1 Plays and Every 1 Gives. To date, more than $3.5 million has been spent and distributed through programming, financial contributions and in-kind donations. Also, more than 12,000 student-athletes have been impacted by Every 1 Plays initiatives, which focus on high school football development, character building and mentoring. 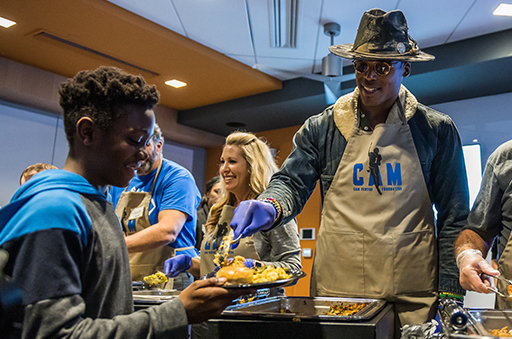 And after Monday’s event, the Cam Newton Foundation has now fed or provided help for more than 11,150 youth during the holiday seasons. In honor of Newton being named this week’s Community MVP, the NFLPA will make a $10,000 contribution to his foundation or charity of choice along with an in-kind donation to him on behalf of our supporting partner Delta Private Jets. A limited-edition bobblehead will also be made of Newton and sold by our supporting partner Forever Collectibles at www.sportsfanisland.comand www.foco.com. The NFLPA will donate part of the proceeds from this collector’s item to their charity or foundation of choice. The NFLPA is also proud to partner with Life is Good, the original positive lifestyle apparel brand, to showcase athletes whose values align with the brand’s commitment to growing the good in their communities and helping those in need. In January 2019, Life is Good will further advance the MVPs’ worthy causes with theLife is Good x NFLPA commemorative T-shirt collection at LifeisGood.com and Fanatics.com. A portion of the proceeds will be donated to each player’s charity or foundation of choice. Newton, along with the other 2018 Community MVPs, will become eligible for this year’s Alan Page Community Award, which is the highest honor that the NFLPA can bestow upon a player. The NFLPA Community MVP program recognizes NFL players who are making a positive impact in their local communities. Each week during the regular season, the NFLPA will celebrate one NFL player who has demonstrated a commitment to giving back to his community. Please visitour websiteto read more about the program as well as the current and past winners.